Now the system I did had an air pump to make bubbles and circulate the oil which dose help a bit but the oil did get pretty hot. It was a celeron 2.5 and geforce 6200. And welcome to the best cooling forum on the net! That actually could be water. Looks pretty clear for oil. Pure water is not conductive. It was water. It was too clear to be oil and the bubbles acted as if they where in water. If you use distilled water, all the impurities are removed and then it isn't conductive. Even the fans on the power supply were turning. Just a thought, if you leave the heatsink and fan on the CPU, even a P4, the fan would move the water past the fins to take the heat from the heatsink. The next problem is how big of a fish tank would you have to get or would you have to use a rad to get rid of the excess heat? 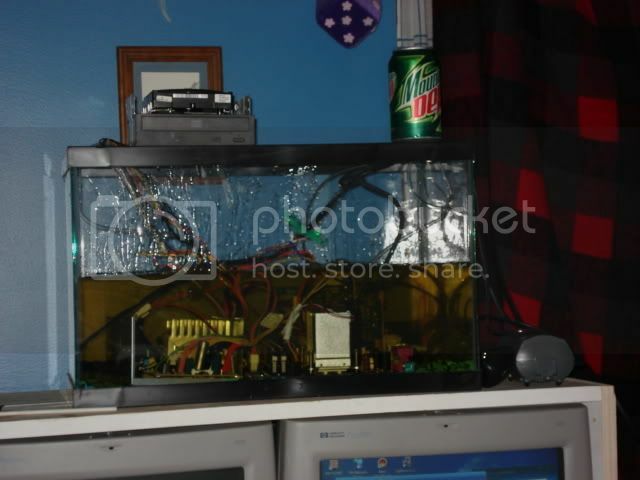 I know this but back when tom's hardware did their oil PC I think they tried to use water but even the purest watter they could find would still cause shorts. From the look of that stuff I don't see why it can't be mineral oil. Dose it say its water or did they tell you that?